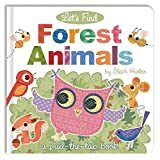 This educational preschool title will help to introduce young children to animals from the wider world and will teach important first words, too. Sally Hopgood has worked in advertising for various agencies across Europe. Steph Hinton has worked closely with Top That Publishing to develop a range of exclusive artwork.